FILE - In this Nov. 7, 2018, file photo, House Minority Leader Nancy Pelosi, D-Calif., speaks in during a news conference on Capitol Hill in Washington. House Democrats are laying out a vision for their new majority, and one item is noticeably missing from the to-do list: President Donald Trump’s impeachment. They’re making plans for spending on public works projects, lowering health costs and increasing government oversight. It’s the balance that Pelosi is trying to strike. WASHINGTON (AP) — Whatever happened to trying to impeach President Donald Trump? https://www.limaohio.com/wp-content/uploads/sites/54/2018/11/web1_121839404-a681a45231124636a92b8dfd05421eb6.jpgFILE - In this Nov. 7, 2018, file photo, House Minority Leader Nancy Pelosi, D-Calif., speaks in during a news conference on Capitol Hill in Washington. 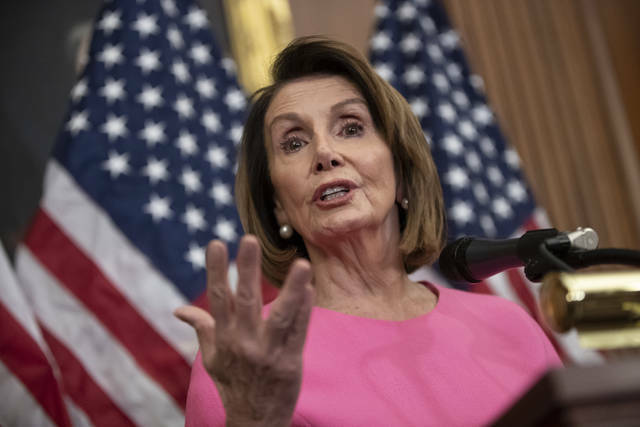 House Democrats are laying out a vision for their new majority, and one item is noticeably missing from the to-do list: President Donald Trump’s impeachment. They’re making plans for spending on public works projects, lowering health costs and increasing government oversight. It’s the balance that Pelosi is trying to strike.